The 2017 Dodge Grand Caravan is all about transporting a bunch of people at an affordable price. This seven-passenger minivan undercuts its least expensive competitor by thousands of dollars when new. Even when loaded to the hilt with options, the price tag doesn't come close to its high-rent rivals. Perhaps somewhat surprisingly, the Grand Caravan doesn't skimp on features even with that budget price. At the most basic SE trim level, the Grand Caravan comes with tri-zone climate control, Dodge's second-row Stow 'n Go seats, and a central touchscreen display and a rearview camera. The Grand Caravan's low price is reflected in its overall lack of refinement compared to the competition, however. This is the 10th model year for this iteration of the Grand Caravan, and the only time the cabin received an update in that time was in 2011. While interior materials are generally fine by today's standards, the overall design looks dated. This is no more apparent than with the inclusion of Dodge's ancient touchscreen interface. Its low-quality graphics and slow response times are outclassed by competitors' systems, especially the Uconnect interface found in the Chrysler Pacifica. The 2017 Dodge Grand Caravan is certainly the least expensive minivan, but spend a little more and you'll get a people mover that feels modern. The new Chrysler Pacifica (which replaces the Town & Country) boasts a luxurious interior and a long list of creature comforts. The Kia Sedona is similarly handsome inside, with available leg cushions for second-row passengers who just want to kick back. The Toyota Sienna's is extremely comfortable and has a stout V6 engine, while Honda's Odyssey gets a full redesign this year and should continue to set the standard for a van that does everything very well. Though these other minivans can't compete with the Grand Caravan on price, the old maxim that you get what you pay for certainly rings true here. The 2017 Dodge Grand Caravan could be right for you if you're searching for a minivan that offers a lot of features and versatility in an inexpensive package. But read more to learn how some other rival vans best the Grand Caravan on refinement and availability of the latest features. The 2017 Dodge Grand Caravan is a seven-passenger minivan offered in four trim levels: SE, SE Plus, SXT and GT. The base SE has a reasonably solid standard equipment list, including 17-inch steel wheels, heated mirrors, tri-zone climate control (with rear air-conditioning), cruise control, rearview camera, a tilt-and-telescoping steering wheel with audio controls, a conversation mirror, a second-row bench seat with the Stow 'n Go fold-into-the-floor feature, and power locks, mirrors and front windows. Entertainment comes in the form of a six-speaker audio system with a CD player and an auxiliary audio jack, controlled via a 6.5-inch touchscreen display. The SE can be ordered with the Uconnect Hands-Free Group package, which adds an auto-dimming rearview mirror, a leather-wrapped steering wheel and shifter, satellite radio, a USB port, and Bluetooth audio and phone connectivity. For buyers with special mobility needs, the Mobility Prep Package II with Load Leveling is available on the SE. Second-row bucket seats are an optional upgrade. The SE Plus comes with the above equipment as standard, plus 17-inch alloy wheels, upgraded upholstery and trim, a front floor console, second-row captain's chairs with an additional floor console and rear privacy glass. The Grand Caravan SXT added features include chrome exterior trim, foglights, automatic headlights, roof rails,power sliding rear doors, a power liftgate, remote engine start, a larger floor console, leather upholstery with suede inserts and an eight-way power driver seat (with power lumbar). The SXT's feature-rich Driver Convenience Group package adds a rear overhead console, an overhead storage bin, automatic climate control, a heated steering wheel, second- and third-row sunshades, heated front and second-row seats, ambient lighting and voice controls. The range-topping Grand Caravan is the GT. It takes the standard content from the SXT with the Driver Convenience Group (minus the chrome and roof rails)and adds a body-colored grille,a performance-tuned suspension, different wheels, black interior accents, a driver information center, a 115-volt household-style outlet, full leather seating, an eight-way power passenger seat, a 6.5-inch touchscreen display with navigation, a rearview camera and an upgraded nine-speaker audio system.. Different trims also get access to special options packages. All models can be ordered with a DVD entertainment system, which bundles the GT's touchscreen with a 9-inch second-row display screen, an HDMI input, the rearview camera, satellite radio, two USB charging ports and a 115-volt power outlet. The Blacktop appearance package, available on the SE Plus and SXT trims, adds silver interior accents and a black grille, wheels and leather interior accents. The GT-only Safety Sphere group adds rear parking sensors, blind-spot monitoring and rear cross-traffic alert. There's a single engine for all versions of the 2017 Dodge Grand Caravan: a 3.6-liter V6 that produces 283 horsepower and 260 pound-feet of torque. A six-speed automatic transmission sends power to the front wheels. 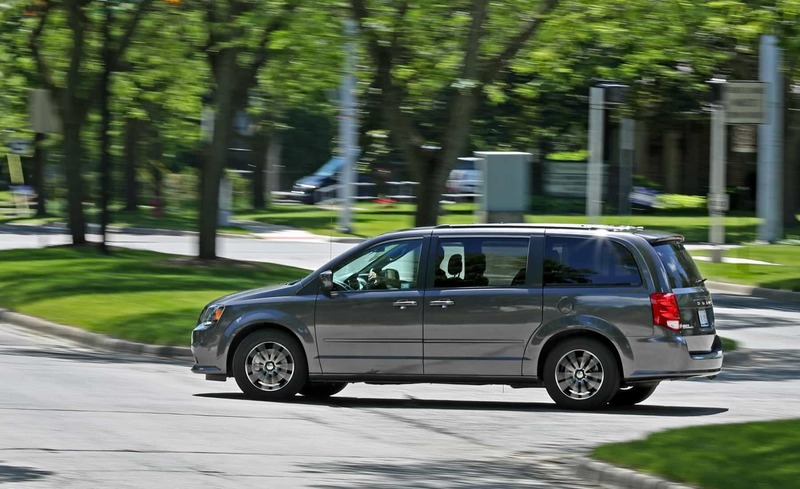 In testing, a Grand Caravan accelerated from zero to 60 mph in 8 seconds, an average time for a minivan. The Grand Caravan's EPA-estimated fuel economy is 20 mpg combined (17 city/25 highway), which is average for the segment. You'll find good outward vision from an upright front-seat position, but some drivers, particularly taller ones, are likely to find the seat placement awkward, mostly because the pedals seem too close to the driver. Gauges are simple and usable. Cabin plastics and other materials, including the cloth seat upholstery, are satisfactory, but the other vans' interiors manage to look and feel a little more upscale. It's hard not to love Dodge's ultra-useful Stow 'n Go second-row seats that disappear into the floor with the flick of a lever. Standard on every Grand Caravan, they transform from max people-carrying mode to max cargo-carrying mode with little effort required. The third-row seats fold backward into a deep cargo well, although they demand a few extra strap and lever pulls to make the transition. Luggage space behind the third row is a useful 33 cubic feet, while you can open up a maximum of 143.8 cubic feet, a space similar to most other minivans, by dropping all the rear seats. The standard 6.5-inch touchscreen interface isn't pretty — most Dodges have moved on to an eye-catching 8.4-inch screen with the more robust Uconnect interface — but the system is pretty easy to use otherwise. The 2017 Dodge Grand Caravan comes up a bit short in overall driving refinement, though it's fair to say that not everybody is going to notice the difference in everyday life. The V6 provides decent acceleration, although it does get pretty loud at full tilt and its automatic transmission doesn't always shift as smoothly as we'd like. The ride is generally comfortable, but other vans absorb road bumps better and transmit fewer impacts to the passengers. It's a similar story going around turns or maneuvering through traffic. Although agile handling isn't a requisite in this class, the Grand Caravan doesn't inspire as much driver confidence as the Odyssey.